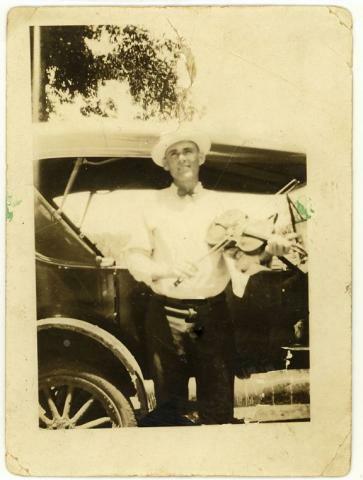 On Saturday, November 13 the Alabama Folklife Association will sponsor a tribute to master fiddler Charlie Stripling. Hosted by the citizens of Belk, the program will be held at the Belk Community Center, located at 7941 Highway 96, which is around 6 miles from where Charlie grew up. Charlie Stripling is remembered in the West Alabama area for his appearances at dances and fiddling championships. Some of his performances have also been preserved on commercial recordings from the 1920s and 1930s that include his brother Ira on guitar. At 12:00 the doors will open for an open jam session for anyone who wants to bring an instrument. The tribute program will begin at 2:00 and includes a filming of “Winging My Way Back Home,” directed by Jeri Vaughn of Seattle, Washington; short talks by Vaughn, fiddle scholar Joyce Cauthen and Stripling family members will follow and then Stripling tunes will be performed by Red Mountain from Birmingham; W.B. Reid and Bonnie Zahnow from Seattle; and Jim Brock and Friends from Carrollton, Ala.
At 6:00 a fundraiser supper for the Belk Community Center will be served. Plates are $9 each and include a choice of fried catfish or chicken fingers. Trimmings will include homemade cole slaw, french fries, hush puppies and homemade cake. Be sure to bring your appetite for that!